Live life easier with reisenthel! An elegant shopping trolley, a sturdy all round genius made by reisenthel. The carrycruiser helps you roll your shopping home comfortably, fits in most car trunks and can be easily carried on your shoulder with the included shoulder strap. Whether a shopping trip to the grocery store, an early morning at the farmer's market, a casual al fresco lunch in the park or simply transporting additional supplies to and from work, the carrycruiser is designed for ultimate style, function and durability. 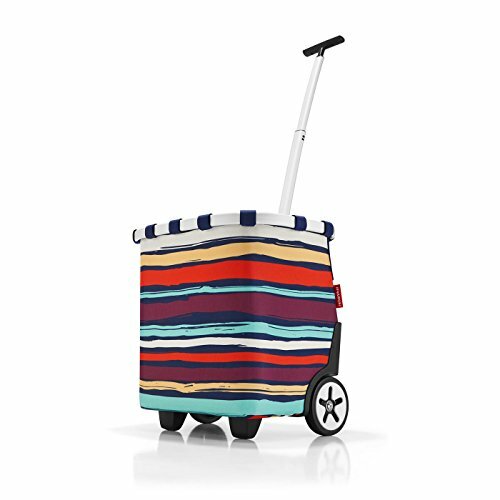 A convenient accessory in a unique striped print, mix and match this carrycruiser with other reisenthel products to complete all of your travel and toting needs. The reisenthel carrycruiser is made from easy-to-clean, premium quality, water-repellent polyester and measures 16-1/2-inches long by 12-1/2-inches wide by 18-3/4-inches high. Equipped with a sturdy aluminum frame, it has an adjustable 2-stage telescopic handle to comfortably accommodate different heights. Its plastic base feet provide self-standing support while its smooth-turning wheels are easy to navigate and even better, includes an attachment to secure it to a grocery cart while shopping. Featuring a removable mesh inner pocket and removable washable lining with toggle fastener, maintenance is simple making this trolley a sturdy, comfortable and practical addition to simplify every day life. Since 1971, reisenthel has been synonymous with innovative ideas, functional design and delightful everyday helpers. They aim for simplicity making each product straightforward and uncomplicated. Innovative, intelligent and practical - these are qualities that make reisenthel products what they are. If you have any questions about this product by reisenthel, contact us by completing and submitting the form below. If you are looking for a specif part number, please include it with your message.